What keeps the laser from toasting the drive belt? Is it too out of focus by the time it hits it? That’s what he was saying on the forum post. Others were recommending perhaps adding some shielding. You could manage it pretty easily, there’s a lot of room to work with.Some thin sheet metal, bent with a slot to fit the middle bar perhaps. I was more bothered by the use of galvanized expanding mesh. The reasoning of “I’m venting it anyway so who cares” hurts my brain. I know that zinc vapor is a health hazard when directly inhaled, but I would not consider it an environmental hazard. At least it IS an essential trace mineral for your body. 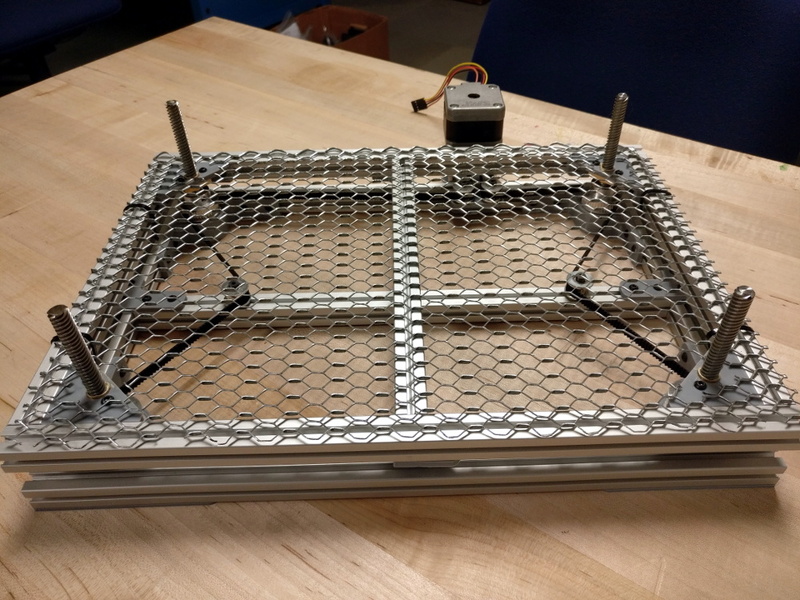 Yeah, the galvanized mesh will have some bad off gassing initially when heated up, but the laser should be run with an exhaust vent anyways, so it should be a non issue. I actually got a lot of feedback on my reddit thread on the belt path, and the feedback seems split down the middle on if the laser will ruin the belt or not. I went ahead and designed some new idler holders and tensioner to get the belt path to go around the perimeter instead of through the middle. It’s a completely optional upgrade now. The new idler holders will actually eliminate the need for the expensive shoulder bolts for the idlers and eliminate the bottom middle extrusion piece. I haven’t uploaded the new models to the repo yet. Hey Aaron, I really like your design and I am in the midst of a k40 re-re-build at the moment. I’d really like to make this, and it sounds like the second version is a bit simpler. Any update on when you might upload the models? Thanks for your work! Hey Jason, I don’t normally check this article for updates. Feel free to post a question on the git repo or open an issue for it! I’d be happy to help you out with this! Exactly, the laser needs to be fairly accurately focused to deliver any power to the surface. That’s one of the reasons people add automatic Z tables to begin with; as you cut deeper into the material you’ll need to raise it up closer to the laser so that it is able make subsequent cuts. So the belts are far enough away that the laser shouldn’t bother them, plus they would normally be covered by whatever is being cut anyway. I have black marks on my workbench where the out of focus beam went through the stupid vent hole in the bottom of the metal case. I think it would do some damage to the belts before too long. Why do people feel the need to chime in with their opinions on things they haven’t tried like whether or not the laser will harm the belt? Sure, if two people in a bar were talking about an idea, maybe drawing some designs on a napkin or something their opinions on how it will work might carry equal weight. This isn’t a hypothetical drawn on a bar napkin. This is something somebody actually built. Don’t you think he knows if it worked or not? Don’t you think he knows if the belt was safe, singed or cut? Don’t you think he thought to look for that? Opinions and guesses have their place but when the hardware has already been built they are as worthless as they are freely given. The only thing of value now is to repeat his build and see if the results are repeatable. It’s not just a maker thing. Imagine how much better the world would be if people would just realize that their opinions are worthless in the face of observed facts. Politics would be so much better. Religion would pretty much evaporate. Progress would accelerate 1000 fold.